The end of Winter is nearing. Soon there will be new seasonal produce as the weather warms and new vegetables and fruit are encouraged to flourish in the sunshine. For now, the battle remains to keep the winter germs at bay. There seems to be a constant round of new bugs going around school and kinder. We have escaped lightly this year to date (touch wood!). 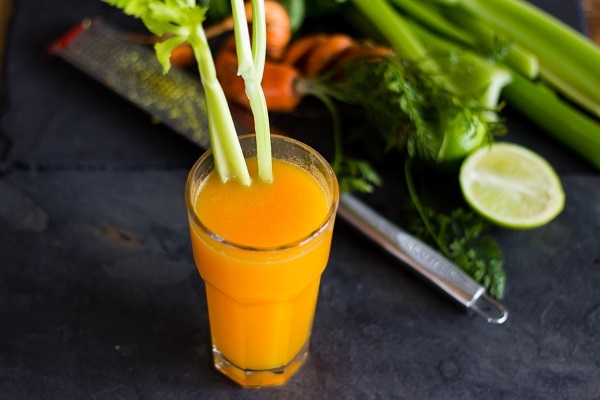 I am convinced that gorgeous fresh juices such as this one help to keep energy levels high and boost the body’s defences. This juice was made from some very wonky fresh carrots that we collected from the vegetable garden. Carrots are not difficult to grow and are fun for the kids. The crazy shapes make for entertaining meal time conversations. It really doesn’t matter what the shape is. Enjoy fresh carrots raw, shred them in the food processor so that they can be added to an array of family meals or of course add them to a juice as I have done in this recipe. Add the ingredients (minus the celery stick) to your Blitz2Go container. Pulse until well combined and serve with a celery stick if desired. My kids are happy to munch on it after enjoying their juice.